A gray haze of anticlimax hung over Thursday’s announcement that Minnesota’s Department of Natural Resources, to the surprise of absolutely no one, has approved the much-revised proposal by PolyMet Mining Corp. to bring copper-nickel mining to Minnesota’s north woods. As an agency charged with promoting the mining industry while regulating its constituent companies and collecting revenue from their activity, the DNR over the last six years has given PolyMet the benefit of many a doubt concerning its NorthMet mine near Babbitt. Indeed, its flexibility has sometimes resulted in the U.S. Environmental Protection Agency sending its approvals back for a do-over. So it was a foregone conclusion that the DNR would find the final environmental impact statement (EIS) to be “adequate,” in the terminology of statutory requirement, and it was no less foregone for being long awaited. Everybody understands this signoff to be the one that matters the most by far, and not just for PolyMet’s project but also for those who follow its precedent. Nevertheless, Commissioner Tom Landwehr reliably reminds us that his is but one among many agencies responsible for assuring that PolyMet lives up to its sales pitch, and he kept at it yesterday. The most massive environmental review ever undertaken in Minnesota is now complete, and the staffers who spent an aggregate 90,000 hours – 45 FTE years! – on the process deserve a big round of applause. Mind you, however, that DNR’s decision does not guarantee that PolyMet’s mining will be environmentally clean and safe. It means only that whatever undesirable impacts ensue from the mining as conducted according to PolyMet’s plan – a qualifier the commissioner repeated in various forms throughout the session – can be addressed if the company follows through with mitigation measures as outlined in the EIS. Official review of PolyMet’s operations aren’t over by a long shot, as more than 20 different types of permits will have to be issued for the mining to move forward, and only 16 of those are administered by Minnesota state agencies. Others rest with the U.S. Forest Service, expected to finish its review later this spring, and the U.S. Army Corps of Engineers, which will fall in line sometime after that. As for the adequacy of “financial assurances” that will be required of PolyMet, Landwehr said his agency has begun to look for experts who can advise it on how best to monetize various risk scenarios, and as to which instruments can reliably shield taxpayers from cleanup costs that could run for centuries. Honestly. You might think that by now the state’s lead agency on mining regulation would have a better handle on such a critical hurdle – one many analysts consider essentially impossible for any company to clear in the boom-and-bust, bankruptcy-and-takeover race to dig precious metals. That the NorthMet project will fulfill PolyMet’s promise to deliver the first large sulfide-ore mine in world history to open, operate and close down without leaving behind a legacy of acid, toxic drainage. Minnesotans have been hearing for a long time about the problem of leaching sulfides into the groundwater in this pristine part of the state. Is the adequacy finding a vote of confidence that we needn’t worry about that? I guess assurances beyond that are not really the purview of the Minnesota Department of Mineral — I mean Natural — Resources. After hearing Landwehr distinguish several times between reviews at the EIS stage versus those that would follow permit applications, Minnesota Public Radio’s Dan Kraker asked if, given the celebrated thoroughness of the review completed yesterday, permit approvals weren’t essentially foregone conclusions. This is an important point, with our governor among others urging us to believe that having allowed the PolyMet proposal to come this far, state officials present and future will possess the political will (and legal confidence) to deny critical permits over matters that presumably ought to have been considered in those 45 FTE years of EIS review. The EIS is the process up to the point where the buyer decides to write a purchase offer, having picked a neighborhood and checked out the schools and so on. What happens afterward is analogous to securing a mortgage, getting a mover lined up and so forth. That didn’t seem to get to the heart of the question, so Kraker followed up by asking whether any projects reviewed by DNR had ever passed the EIS stage but then failed to obtain necessary permits. Consulting with an agency colleague, Landwehr said there had indeed been projects that got EIS approval but then stalled for reasons they couldn’t clearly recall. 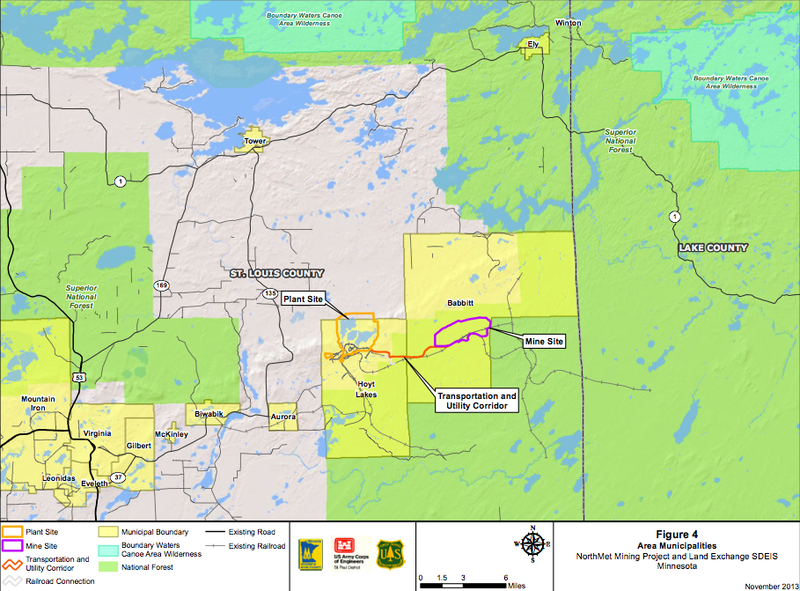 Map of PolyMet’s Northmet proposal. Click for larger version. I admired Kraker’s question and thought it deserved a clearer answer still, given the importance everyone is placing on permit review, so I asked my own followups, the better of which went like this: Are you saying, Commissioner, that it is possible for PolyMet, having passed muster on all of the technical issues reviewed as part of the EIS process, to fail to pass muster on these same issues in permit reviews? The project actually morphs a little bit during the permit review process. Because if a model is run and it demonstrates that you’re not going to meet the standard, then we go back to the company and say, what are you going to do to meet that? The company will revise its plan and come back with it. So there’s been this iterative process to address each of these issues so the company at least understands what they need to do to meet a state standard. Now, presumably as they’re doing that analysis they’re also determining that that’s economically viable. As we get into the actual implementation, now it’s going beyond that conceptual, going to the actual, and I presume that there are still instances where somebody could say, well, we can’t meet that. I presume there’s still that possibility. But there’s been so much thought, so much collaboration among the [review agencies], that I have to assume the majority of those possibilities have been thought through pretty well. Permit review gets to a deeper level of detail in some respects than the EIS review, in part because actual equipment and site work come into consideration. Anything’s possible. But having come this far and spent this much effort and money, PolyMet can safely assume that big surprises are unlikely. That would be like a home buyer suddenly telling the seller, cancel my offer – you never told me the fireplace doors were ugly! So the company may have to do some things a little differently, maybe spend a little more. But in the end, we and the other agencies will require that all state standards are met to protect public health and the environment. And we’ll do that just as vigorously as we have with, say, all the air- and water-quality violations at the taconite operations that have, among other things, led EPA to pressure Minnesota to pick up the pace, and prompted a legislative effort to rewrite sulfate standards in wild-rice areas to be more accommodating to mines, and inspired a legal effort to force the feds to take back some of the enforcement authority long delegated to the state. But really, what more than that can the taxpayers of Minnesota expect from a regulatory apparatus whose lead agency on copper/nickel mining is supposed to promote the industry with one hand and police it with the other? Disclosure: In 2007 and 2008 I served as executive director of Friends of the Boundary Wilderness. Based on previous journalistic investigation I positioned the group in opposition to any precious-metal mining that couldn’t first be proven safe in terms of lasting damage to the watery north woods environment. That’s a test I both hope and doubt can be met by PolyMet and other companies eyeing Minnesota’s copper/nickel deposits, because it really would the first such achievement in history. What distinguishes the NorthMet project is the certainty of long-term acid formation and drainage as air and water act on sulfides in the waste rock. Mine-waste release in B.C. raises question: Would better regulators oversee Minnesota mines? It seems probable that Canada's Mount Polley story will evolve as a tale of chronic regulatory underperformance. Submitted by Peter Gove on 03/04/2016 - 11:18 am. Submitted by Dennis Litfin on 03/04/2016 - 11:28 am. Mining will be environmentally clean and safe”. Isn’t that what this is all about? Submitted by Keith Kuckler on 03/04/2016 - 11:38 am. We need to take a look at what is happening in the coal mining industry right now. With the huge shift from coal to natural gas, coal mining companies are declaring bankruptcy. Many states have had very lax bonding procedures, even allowing companies to “self bond”. The costs of the land reclamation is huge, and, the money will not be there. This should be a wakeup call for us. Submitted by Steve Titterud on 03/05/2016 - 01:54 am. Excellent point, goes to the heart of the issue. I am hoping the DNR (impossibly conflicted in its dual roles of environmental protector and promoter of mining) will insist that financial assurances MUST involve third party bonding sources who are FULLY PAID UP IN ADVANCE as to their financial obligations for remediation of negative environmental consequences, which seem sure to follow this operation, if all permits are granted. And even if this is so, who knows how long those bonding entities will survive ?? 500 years is a long time. As you have so ably pointed out, the boom and bust cycle of economic fortunes in the extraction industries is a serious threat to ongoing financial accountability. We simply cannot responsibly accept Polymet’s assurance that they will continue to pay premiums. They may be unable or unwilling to do so. And what is the benefit we would be seeking ?? A few hundred jobs for 20 years or so ?? With all due respect to the unions and the people up north who are suffering from a loss of jobs (due to the cyclical nature of extraction industries), we should find a way to promote SUSTAINABLE economic development not reliant on cyclical extraction industries. THAT is what the people in the area really need – SUSTAINABLE jobs, not necessarily extraction. I hope this is not a case of “the fix is in”. Submitted by Elanne Palcich on 03/04/2016 - 04:47 pm. Now Landwehr can just get back to managing deer and walleye and buffers on public lands (which seems to be controversial enough). Unfortunately, PolyMet is being labeled as the answer to the economic problems of the Iron Range, as the taconite industry falters. The permitting of PolyMet is being framed as a jobs issue, rather than a water issue. Polluted water leads to an unhealthy environment–for plants, animals, and people. Clean and plentiful water is a valuable natural resource in its own right. We are not learning from the existing water contamination problems caused by big ag and taconite mining. (Along with potential water shortages in parts of the state due to overuse and poor practices.) It’s just full speed ahead doing more of the same. I can only hope that we come to our senses soon. Submitted by Joe Musich on 03/04/2016 - 08:28 pm. the people’s interests particularly public health are not of primary importance. We now have destruction greater then the evil of Flint at hand all which will be within the parameters of law. This really allows someone not from NE Mn or Mn at all to take for themselves the value of the resources. And the on top of that poison the people and the land. Submitted by Tom Anderson on 03/04/2016 - 10:45 pm. To kill the project. He must wait a careful amount of time so that the dots aren’t connected between his Commissioner, the six years of government work, the financial investigation (which he hasn’t started yet), and the need for mines in the USA to produce what gets “dumped” here by other nations to satisfy our countries needs. I would expect “the toughest decision that he’ll ever make” to occur sometime next year, after the Presidential election, and well into the summer of 2017. Submitted by joe smith on 03/06/2016 - 09:39 am. Can’t wait for Polymet to get up and running. Folks being hired with high paying jobs working in the mines, start up companies to serve the industry and the folks that work for those servicing companies will all be bringing in paychecks. I love when the DNR spends years studying (delaying) projects and finally permit them, they are sell outs to those who are anti-mining. Submitted by Harris Goldstein on 03/07/2016 - 10:09 am. The EIS says that, if followed to the letter, we can contain (not avoid) pollution for 100s of years. This is based on technology that we think will work (hasn’t been tried at production levels) and that we think we can fund. It will be funded by a company that has no profits nor revenue – except for (potentially) the mine that will be producing the copper and it’s attendant pollution. At best, Glencore – who currently owns about 1/3 of Polymet – will take over. But they have their own issues, with their stock down almost 1/2 over the past 12 months. The price of copper (which will fund any containment and cleanup) has dropped about 1/2 over the past 5 years and Glencore has been cutting production. None the less, let’s see how much “skin” they’re willing to have in the financial assurance game. Will be telling. But make no mistake, the financial assurance offered by Polymet will likely be both based on “best” case and have a lot of smoke and mirrors financing. In the end, just like the banking crisis, profits will be privatized and losses socialized.